A little while ago some friends in our community raised a valid concern. but the educational aspect of the day has been somewhat lacking in recent years. So our friends asked us to consider what we could do to change that. At Streetspace Bournemouth we are always keen to try something new so we set about praying, hoping to hear an answer. We believe in a God that speaks! At first we considered commissioning some young artists and hosting an exhibition but we are keen to engage with all members of our community and so creating an intergenerational activity seemed more in keeping with our ethos. We know some fabulous older people, we refer to them as 'Young at Heart' and we know they have craft skills to rival Kirstie Allsopp so this project just leapt off the page at us. 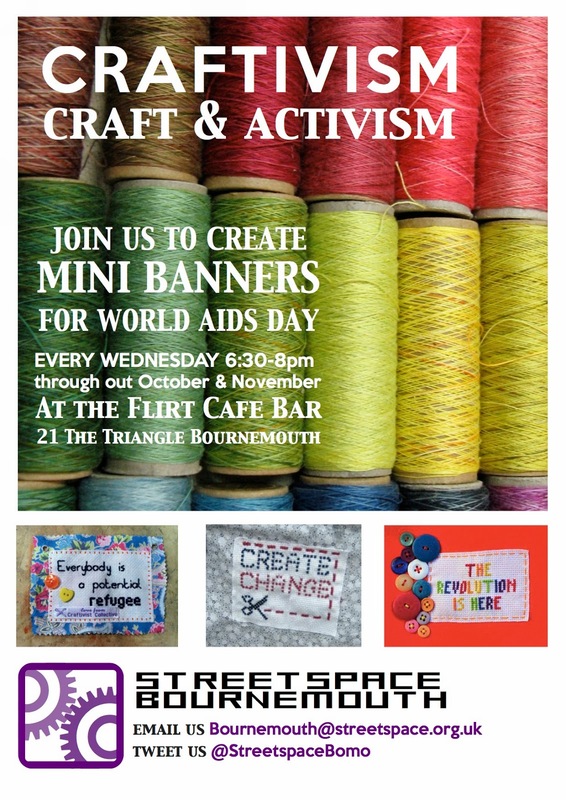 Craftivism combines the age old acts of activism and craft. Now I know activism has had a rough ride, activists are often seem as extremists, intent on breaking rules and causing chaos but this type of activism is a little different. I am not sure craft has rules to break? The term craftivism was coined in 2003 by writer Betsy Greer in order to join the separate spheres of craft and activism. Her favourite self-created definition of the term states, "craftivism is a way of looking at life where voicing opinions through creativity makes your voice stronger, your compassion deeper & your quest for justice more infinite"
Our goal over Wednesday evenings throughout October and November is to gather as many people together as possible. For each of them to create a mini banner, these mini banners will have cross stitched statistics and messages aimed at raising an awareness of HIV/Aids as well as adding bursts of beauty to our neighbourhood. leaving a quiz trail for people to follow to discover the answers and win a prize. The great news is you can join us! No previous craft experience necessary just a desire to be part of something meaningful. 1st time, he is 34yrs old and loved it, look at his happy, content face!